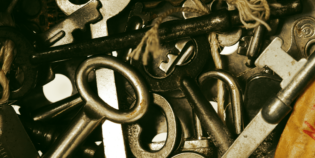 Building an effective and engaged subscriber list, although crucial to email marketing success, is just one single element of a larger puzzle. Maintaining and managing an existing email list may in fact be just as important, if not more, as attracting new leads and prospects. Let’s take another look at inactive subscribers and follow this step-by-step guide on bringing them back to life, in turn increasing the effectiveness of your marketing campaigns. Why bother with reactivating an email list? Even if you don’t want to admit it, some of your subscribers are probably fast asleep and have stopped reading your emails for one reason or another. Not only is this normal, it’s nothing to be ashamed of. What you do with it though, is an element that can help you boost your sales and improve your performance metrics like nothing else. How many of your subscribers become inactive depends largely on your regular list management practices. However, it doesn’t stop there – your efforts to keep your audience interested and engaged by offering valuable content is important too. This may sound like a long and difficult process, and I am not going to say it isn’t. There are however several main reasons why you should definitely put reactivating subscribers on your to do list. The topic of reactivating your inactive subscribers may come up when you have just began to work with an entirely new email service provider. One of the less obvious reasons why your audience may have been inactive might be something as trivial as the fact that they never received the communication in the first place. On the other hand, if the deliverability levels offered by your newly chosen ESP are higher, a sudden increase in the number of emails your subscribers receive may irritate them and cause higher unsubscribe rates. To avoid this, you need to first reactivate them and prepare for the upcoming increase of communication intensity. At some point, after finishing a particular promotional campaign or while taking part in an event, we’ve gathered a list of subscribers to whom we haven’t actually sent any messages in a long time. A similar situation can happen if one company acquires or merges with another, where both had their own email lists. Some of those subscribers may have been left out from regular newsletter communication and thus became inactive. Before you jump right in and start your regular email communication with these subscribers, it’s usually better to aid their memory and remind them of your brand. When having a conversation with such readers, you’ll need to take extra care and let them know how often they should expect to hear from you and how they will benefit from it. On top of that, it’s worth mentioning to your reactivated subscribers that they can opt out at any time, in order to avoid having your emails marked as spam. Since these could negatively affect the effectiveness of your future email marketing campaigns, it’s usually better to be safe than sorry. Most marketing reports and researches agree that it is usually more expensive to acquire a new client than to maintain the old one. To take better care of your financial situation, it’s worth your time to think about reactivating your old and inactive subscribers than to focus solely on attracting new ones. They are already aware of your brand and may even remember having positive experience with it, which should also work to your benefit. 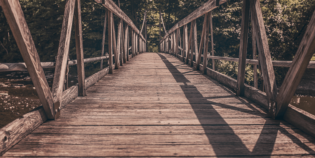 Clients who have already had contact with you in the past or have tried your products should typically require less persuasion and time to try out the offer once again. Since you’ve already earned their trust, they will probably be more likely to work with you again, especially if the offer matches their needs. Yet another great reason, which should convince you that email list reactivation is an important topic, is email deliverability and the reputation of your domain and IPs. Repeatedly sending emails to subscribers who no longer open your emails will have a negative impact on the deliverability of your present and future email campaigns. Showing the ISPs that you manage your list’s hygiene and trying to reengage your audiences shows them that your emails should be filtered in a more favorable manner and reach their inboxes without needless delays. How to run an effective reactivation campaign? To run an effective campaign that will reengage the subscribers who stopped opening your emails you should start by defining the specific time length of inactivity that is relevant for you. Depending on your business model and the type of content you are promoting, users that did not read any of your messages in a month could be defined as inactive. On the other hand, if your products are purchased only from time to time (e.g. furniture or health products for pregnant women) then your approach may be different. Typically, when discussing products that are not consumed or purchased in a very time-specific manner, you may treat subscribers who did not show any engagement in your communication in about 90-180 days as inactive. Your next step should be to locate the users you have previously defined as inactive amongst all of your current subscribers. Most of the time, inactivity refers to showing no signs of email opens and clicks on links that are contained in sent emails. In which campaign am I looking for inactive subscribers? How much time must have passed since they opted in to your list? How much time must have passed since they opened any of your messages? Once you have located that specific group, save your search to have a separate segment to which you’ll target your reactivation emails. Perhaps the most important part of this process is to plan out and design the messages that will reengage your inactive subscribers. 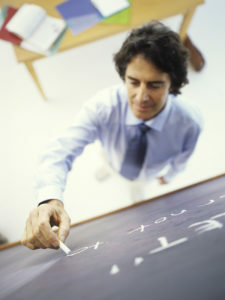 The last step of your reactivation campaign should be to become systematic in analyzing your communication. Firstly, people who have opened your emails should be automatically transferred to another segment or campaign so that they no longer receive the reactivation emails. You should adapt your tone of communication accordingly and work intensely on your relationship with them to turn them into loyal and happy clients. Secondly, analyze your open and click-through rates along with the number of bounces and spam complaints. If the latter two metrics increase, they may affect your deliverability and the success rate of other campaigns. Aim to run reactivation campaigns regularly. This should be a continuous process, not an on-and-off project. This way you won’t have to reactivate larger number of subscribers all at once, which in turn will have a positive effect on your IPs’ and domain reputation. Remember that at the end of the day, what is important is conversion. Even if your open rates are an important metric, you have to focus on the number of people who make an appropriate action. Regardless if it is an action of ordering a product, filling out a survey, visiting your website, or liking your Facebook fan page. Below I have prepared a few examples of reactivation emails, that have been used by brands from around the world. Note that each of them takes a slightly different approach. 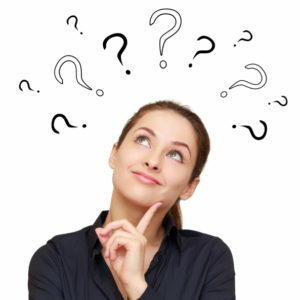 If you don’t know what kind of message will work best for your audience simply run an A/B Test and wonder no longer. 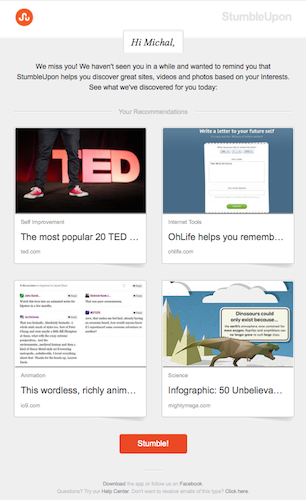 This way you’ll get to know your audience and their preferences better. 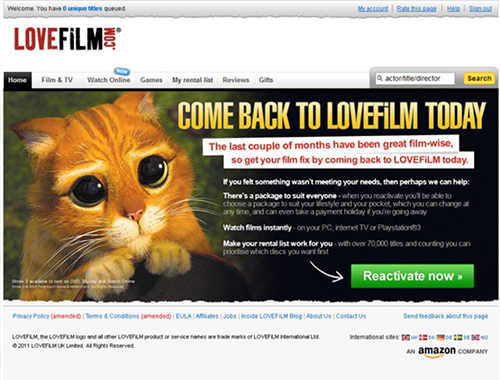 An example from a company called lovefilm.com using a humorous approach to win back their inactive subscribers. 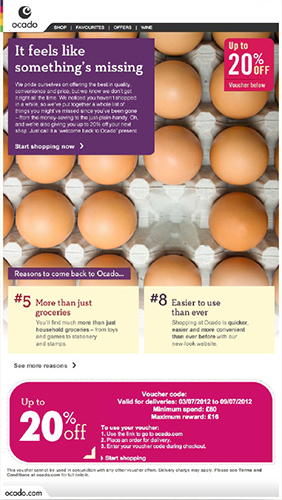 A reactivation message from Ocado using a discount code and images that evoke emotions. 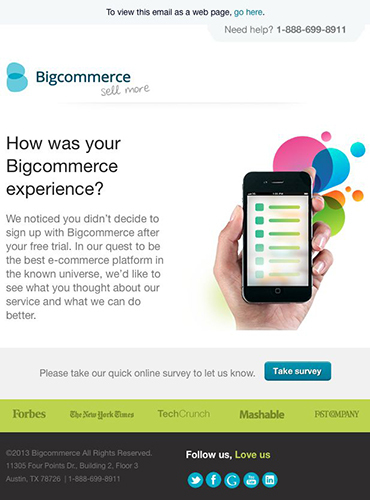 An example from Bigcommerce inviting subscribers to fill out a survey to talk about their experiences with the service.